The handset features a 5.5-inch Full HD display, Qualcomm Snapdragon 801 processor, 16 GB of storage and can be already pre-ordered, while the first batch is expected at the end of the month. Oppo revealed the Find 7a earlier this year at MWC 2014 and now this 5.5-inch Android handset is almost ready to ship. The Qualcomm Snapdragon 801-powered smartphone comes in white or black and is also accompanied by three gifts during the pre-order period which began on April 7 and will close later this month, as soon as the first batch ships out. Oppo Find 7a can be pre-ordered internationally and first orders will also come with a free extra battery, 32 GB microSD card and a Navy Blue cover, only available while supplies last. 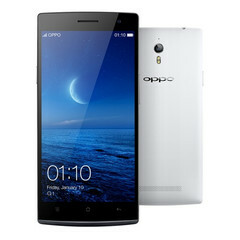 The US version of the handset is priced at $499 USD (€399 EUR for those who order from the European Oppo website).